If you are looking for excellent quality horse bits you came to the right place. Here at Horse Tack Now we strive to offer the finest products available. 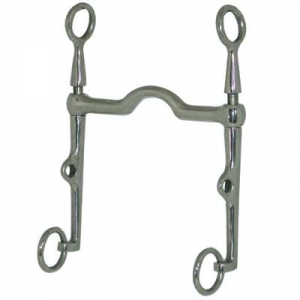 The Tom Bass Low Wide Port Weymouth Bit that we offer is a top quality item for your horse. This Sliding Cheek bit is made of top quality materials which will last a lifetime. It comes in size 7 1/2'' shank. If you are in need of low wide port weymouth bits we have just what you need for your horses at unbeatable prices. Treat your horse with this comfortable bit and go for a ride today.